In this start to an all-new series, Samantha begins writing her school paper’s advice column—and finds out fast that some things are easier said than written. Every middle-school girl has questions about her future, but to star school newspaper reporter Samantha Martone, getting the scoop is her life. Sam plans to travel the world someday as a journalist, and in the meantime she’s thrilled that her newspaper adviser, Mr. Trigg, has chosen her for a special gig: For the next year, she’ll be the school’s anonymous advice columnist. 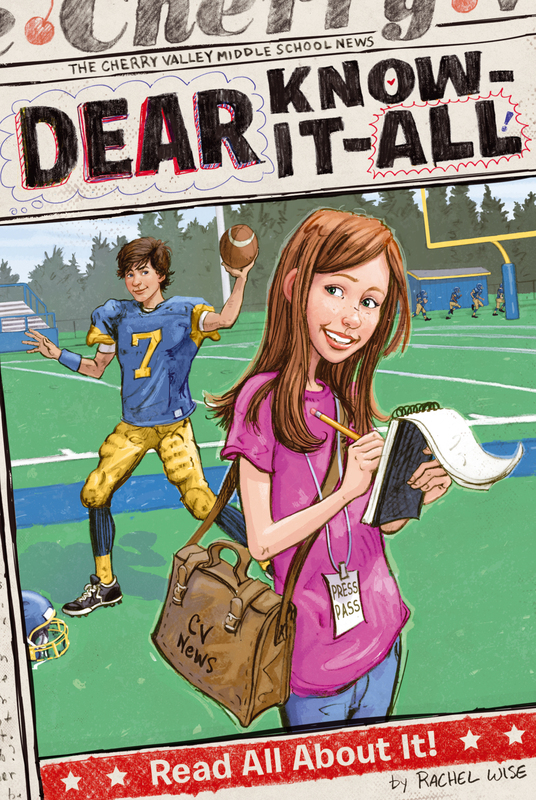 Being the voice of “Dear Know-It-All” is exciting, and an important secret to keep—especially when Sam figures out that one of the letters she receives is actually from her best friend. Sam’s mortified to learn her BFF also has a crush on fellow newspaper staffer—and pitcher for the baseball team—Michael Lawrence. Can Sam still give good advice when her own love interest is on the line? MARTONE SAYS SCHOOL YEAR OFF TO GOOD START! Do you need to know everything about everything? I do. I’m kind of a newshound, which is what my parents call me. My sister, Allie, calls me weird. She’s only interested in news about celebrities and certain cute guys in her class. But I am all about real news and how to get it. According to my mom, ever since I could talk, all I’ve done is ask questions. Now that I’m older, asking questions is a habit (sometimes a bad one). The hard part for me is stopping to listen to the answer, because as soon as someone begins to answer, I’m already forming the next question in my mind! This is okay, though, because I want to be a journalist when I grow up, and journalists need to ask lots of questions. The best thing ever happened to me this summer (sorry, sometimes I switch gears fast too!). My aunt Louisa, who is a reporter, and my idol, gave me the most amazing birthday present: one week at a sleepaway writing camp! My best friend, Hailey, goes to sports camp, and she thought writing camp sounded sooooo boring, but it wasn’t at all. And the best part was you got to pick what kind of writing you focused on while you were there. I picked journalism, of course. My teacher was this cool old guy named Mr. Bloom, who’d been the international news desk editor for the New York Times. He was old, but he was really smart, and he taught me a ton about journalism. Journalism is reporting and writing what is going on in the world around you, near and far, and it is really fun because you get to ask lots of questions and learn lots of facts! Every story you write has to answer these questions: What? Who? Where? When? Why? And how? MARTONE OFF TO A GREAT START! Samantha Martone headed back to Cherry Valley Middle School today for her first day of school. When her alarm rang at 6:30 a.m., she hopped out of bed to check all the blogs and news websites she likes to read first thing every morning. After showering and drying her long brown hair, she dressed with care, “Because first impressions matter,” says Martone. At school Martone was thrilled to discover that both her best friend since kindergarten, Hailey Jones, and her major crush, Michael Lawrence, would be in her homeroom this year. During lunch hour, Samantha visited the office of the Cherry Valley Voice, the school newspaper, to sign up as a reporter again with Mr. Trigg, the Voice’s faculty supervisor. (Shh! Don’t tell: Martone would like to be the editor in chief of the Cherry Valley Voice next year!) Samantha Martone is looking forward to another great year at Cherry Valley Middle School. “Cherry Valley rules!” said Ms. Martone. Isn’t that funny? It sounds like real news, right? Pretty much when you call people by their last names, it makes things sound official. That’s just one of the things I’ve learned about journalism during the past year. My favorite thing is writing headlines. I write headlines in my mind all day long. Like, right now I’m on my way home from school. In just one more suburban block (left on Buttermilk Lane), I will reach number seventeen, where I live, and the headline will be Martone Home, Shares Day with Mom. Later it might be Martone Kids Riot, Meatloaf Again! or Reality Sets In as Homework Pile Is Revealed. Actually, that one might be too long. I usually like my headlines to be catchier than that (“pithy” is the word Mr. Trigg uses), but you get the idea. I clomped down a level and found her at her desk. “Hi! How was it?” she asked with a grin. My mom is a freelance bookkeeper and she had a project spread out all across her work area. “Stop!” My mom held her hand up in front like a crossing guard. It’s a sign we agreed on for when I’m asking too many questions and not listening enough, which drives her crazy. “Sit,” she commanded with a smile. I sat. I was smiling too. “Hi, honey,” she said, starting over. “Hi, Mom.” I tried hard to be quiet and not ask any questions for a second. At writing camp they said journalists have to know how to be quiet, too, because sometimes the best information isn’t even spoken aloud. Plus, being a good reporter means you have to be a good listener, too. I told her all about homeroom and how cute Michael Lawrence looks with a tan and how great it was to see Hailey, who’d only gotten back from camp a week earlier and was coming over in an hour to do homework (yes, we have homework already! ), and how I’d signed up for the school paper again and I was thinking of trying out for the soccer team with Hailey, and how we have a new curriculum, and what was for lunch and . . . everything. I was happy too. It had been a great day. Now it was my turn to listen while my mom talked. “Good!” I said, though I was fibbing. I truly cannot imagine how bookkeeping is any fun, but it’s important to make people feel good about the work they do so that they will continue to give you information that you might need for a story. That’s another piece of advice I learned at camp. Not that I had to worry about Mom withholding information, but it was good practice anyway. My mom hadn’t finished. “But more importantly, Mr. Trigg called from school right before you got here. He asked you to call him back. Here’s his direct extension.” My mom handed me a piece of paper. “Why was he calling?” I asked. I took the slip of paper and studied it as if it might contain more information, but all it had was the number. I didn’t like the idea of a call from a teacher. That didn’t sound good. Maybe he was kicking me off the paper! Maybe he thought my writing wasn’t good enough! Now I’ll never stand a chance to be editor in chief. . . . “What did he say?” I asked. I stood up and, still staring at the number in my hand, trudged up the stairs and across the hall to the kitchen. I hesitated to pick up the phone and dial. Usually I love making phone calls. I’ll call anyone! I’m never shy on the phone. But when it’s something about me . . . well. Martone Axed by Trigg, I thought. But no, he wouldn’t call me at home for that. I shook my head, squared my shoulders, and dialed the phone. “Hello?” It was Mr. Trigg. Gosh, he was a fast answerer. My jaw dropped. Dear Know-It-All is the most important column in our school paper! It’s kind of like Dear Abby, where kids write in anonymously about their problems, and the Know-It-All answers. And no matter what is on the front page of the paper, Dear Know-It-All is the first thing all the kids read when the paper comes out, and it is the thing people talk about the most. Whoever writes it each year is a mystery. No one has ever guessed who it is. I actually thought Mr. Trigg himself might be the writer, but apparently not. Anyway, me? Know-It-All? But I don’t know anything! “Uh . . . oh my gosh. Wow! Mr. Trigg! That is so major. I don’t know what to say!” I felt scared, flattered, excited, inspired . . . everything all at once! This was huge. “Well, I hope you will say yes!” said Mr. Trigg. It hadn’t occurred to me to say no. I mean, why would I say no? Okay, I didn’t know a lot about a lot of things. Like boys, for instance. And there were always a lot of letters about boys. But I could learn. Isn’t that what a journalist does? Investigate? Research? Figure it out? Plus, if I did a really good job, maybe it would help me get to the editor in chief position, which is what I really, really wanted for next year. I had to accept. “Well . . . then, yes! Okay. Thank you! I’d love to!” I laughed nervously. I couldn’t wait to tell my friends. “Right.” I nodded. Wait, I can’t even tell Hailey? I thought. Really? Hailey could keep a secret. . . .
“Not even your best friend,” continued Mr. Trigg, as if he was reading my mind. Oh well, that answers that question. “Okay,” I agreed. I hadn’t thought about that. I tell Hailey everything. This could be harder than I thought. Whew, I thought. At least Mom knows. But Mom always said we didn’t have secrets in our family. I wondered if she would tell Allie. I loved the idea that we had a secret from Allie. It looked amazing. But then I crossed it out really dark so no one could ever read it. I just needed to get it out of my system. I closed the notebook, stashed it and the pencil back in my pocket, and just spaced out for a second in the kitchen. Book Cover Image (jpg): Read All About It!